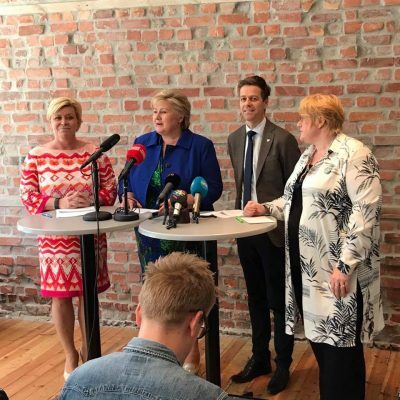 Prime Minister Erna Solberg invited the leaders of Norway’s three other non-socialist parties to her home Thursday evening, just hours after returning from the UN General Assembly in New York. Solberg brushed any jet lag aside to launch exploratory talks that she hopes will lead to the formation of a new four-party conservative government coalition. Solberg is already largely assured that the Progress Party will continue as what Progress leader Siv Jensen has herself called the “junior partner” in Solberg’s coalition. Jensen and Solberg have ruled for the past four years, and won votes of confidence given the results of last week’s election. Jensen is likely to continue as finance minister, with her party retaining control over other key ministries including transport and justice. Solberg wants, and needs, both the Liberals and the Christian Democrats to join them, to form a firm non-socialist majority in Parliament. That’s where the challenge lies: Neither the Liberals nor the Christian Democrats have been keen on being in government with Progress, claiming their politics are too different. Solberg’s job now is to change their minds and convince them that the best, perhaps only, way for them to exert influence and push through their political agenda is for them to all team up “and find the best solutions” through compromise. Newspaper VG reported Thursday evening that Liberals’ leader Trine Skei Grande now has “a clear mandate” from her party’s board to enter into negotiations with Solberg and Jensen. Her party has been divided on the issue, but Grande won a green light to pursue government cooperation. Grande confirmed to VG that she had also met with Christian Democrats leader Knut Arild Hareide before they headed to the prime minister’s residence. Grande wouldn’t reveal details of their conversation, but it’s believed to have been aimed at making sure the Christian Democrats won’t abandon negotiations on how to secure the majority that voters gave the four parties last week. Grande and Hareide are still hanging on to the idea of them ruling with just the Conservatives in a three-party coalition without Progress. That’s widely viewed as unrealistic since they collectively have only around 35 percent of the vote. Grande declared, however, that “this ain’t over before the fat lady sings,” a reference not only to her or Solberg’s weight but to the operatic expression that there can still be hope. Solberg, meanwhile, is expected to tempt both parties with the prospect of ministerial positions in areas of special importance to them, for example foreign aid or climate and the environment. The Conservatives even went so far this week as to suggest that they’d be open to protecting the waters off Lofoten, Vesterålen and Senja from oil and gas exploration, something both Grande and Hareide want. They’ll have additional demands, from schools to municipal reform, but Grande’s list didn’t seem too difficult for Solberg and Jensen to accept. Solberg has evolved into a skilled negotiator and has the advantage that all parties involved like her and want her to be a successful prime minister. But then they must work with her instead of going into opposition and cooperating only on an issue-by-issue basis. Hareide said he would “listen to the signals coming from the Conservaties and Progress” and that Thursday night’s meeting was “a natural part” of supporting Solberg as prime minister. The talks are likely to take several weeks and those involved are not particularly pressed for time. Solberg can and has simply continued as prime minister after the election. The government she led the last four years with Jensen can also continue and they even have a budget ready to present to Parliament in mid-October. They even have a speech ready for King Harald V to read at the formal opening of Parliament. Most don’t expect any new coalition to come together before the end of next month.